Thank you to Carole from My Kitchen Escapades for enlightening me to this recipe! Seriously! You deserve an award! I usually make a green chile and lime shredded pork recipe in the slow cooker when I'm planning pork tacos. That was my plan up until last night when I happened upon Carole's recipe and changed my game plan. Holy moly ... I'm so glad I did! Let it be noted that this recipe does require a couple of extra steps compared to just slow-cooking seasoned pork and then shredding it. It requires that the pork be started on the stove top, then slow-cooked for a couple of hours in the oven, then broken up (while the cooking liquid reduces on the stove top), then combined with said reduced liquid and then broiled in the oven to finish. But, I promise you that it is 100% worth it! This recipe results in tender, juicy meat that is super flavorful and caramelized. 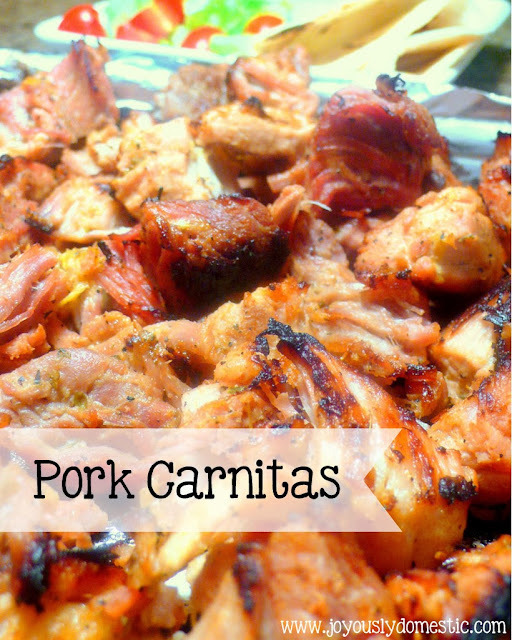 Simply put ... it is pork perfection! Everyone in our house loved this! It's certainly something that I will make again ... many times over! Adjust oven rack to lower position and preheat oven to 300 degrees. Combine all of the ingredients in a large Dutch oven, including the spent orange halves and juice. Once it simmers, cover pot and transfer it to the oven. Remove the pot from the oven and turn on the broiler. Use a slotted spoon to remove the meat from the pan and place it on a large foil-lined jelly roll pan or large baking sheet. Remove and discard everything from the pot except for the cooking liquid. Place pot over high heat on the stove and boil until thick and syrupy ... mine took only about 5 minutes, but it can take up to 20 minutes. You should have about 1 cup of liquid remaining when it is finished. NOTE: When you remove the meat from the oven after cooking until tender, you should have a decent amount of liquid remaining after removing the meat. If you don't, you can add in a little chicken stock, water or some more juice from another orange. This is what I had to do ... I opted for additional orange juice. While the liquid is reducing, use two forks to pull each cube of pork into three equal sized pieces. Once the liquid has becomes thickened, gently fold in the pieces of pork to the pot. Try not to break up the pork any further. Taste and add additional salt and pepper as needed. Spread the pork back onto the foil-lined pan and evenly spread the meat around so that there is a single layer of meat. Place the baking sheet on the middle rack of the oven and broil until the top of the meat is well-browned and edges are slightly crisp, about 5 to 8 minutes. Using a wide metal spatula, flip the pieces of meat and broil the other side until well-browned and edges are slightly crisp, 5 to 8 minutes. (If needed, some olive oil can be drizzled on top of pork to help with the browning process.) Serve immediately in a tortilla with all of your favorite toppings. Oh my! I MUST try this ASAP ~ Thank you!! I can smell it cooking now!